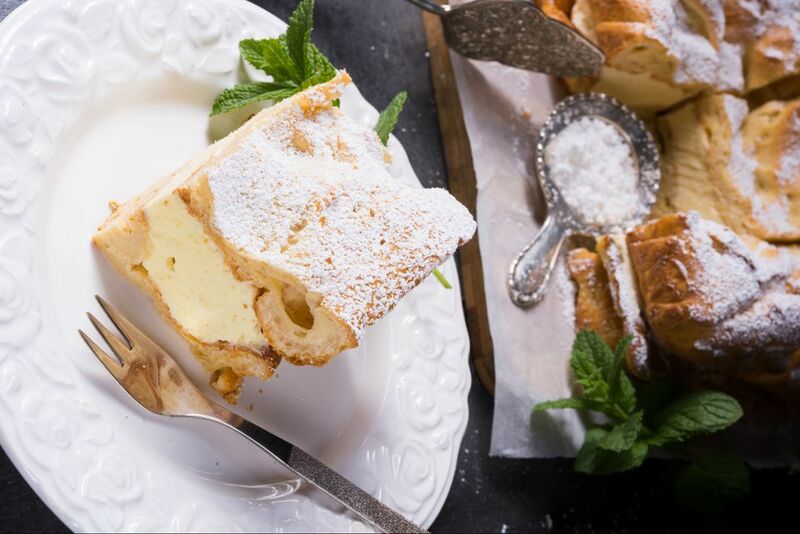 This Polish Carpathian Mountain cream cake recipe is known as karpatka. It's a peasant version of the more refined kremówka, which is made with puff pastry. Karpatka is made with the same type of dough used to make cream puffs and éclairs, known as pâte à choux in French. When dusted with confectioners' sugar, the dessert takes on the look of the craggy, snow-capped Carpathian Mountains, hence its name. In addition to a custard filling, karpatka can be filled with easy pastry cream. Lightly coat a 13x9-inch pan with cooking spray and then line it with parchment paper. In a medium saucepan, bring water, 10 tablespoons/1 1/4 cups butter, and salt to a boil. When butter has completely melted, remove from heat and, using a wooden spoon, add 1 cup flour all at once. Return to stove and stir over low heat for 2 or 3 minutes or until dough cleans sides of pan and forms a ball. Remove from heat and stir in eggs one at a time, beating well, either by hand or with an electric mixer, after each addition. The batter should be smooth and glossy and cling to the spoon. Pour dough into prepared pan, but don't smooth it out. You want the finished top to look like a rugged mountain. Bake 30 minutes. Remove from oven and pierce the top all over with a skewer and bake another 10 minutes or until top is golden brown and dry. Remove from pan and let cool completely on a wire rack before filling. In a medium saucepan, bring milk, sugar, cornstarch, and 2 tablespoons flour to a boil, stirring frequently. Reduce heat and continue to cook and stir until thickened like pudding, at least 2 minutes. Stir in vanilla. Place in an ice water bath to cool to room temperature, stirring occasionally. Make sure the filling is completely cool before beating in 1 1/4 cups/2 1/2 sticks softened butter. Split the cooled pastry in half horizontally. Place the bottom half back in the clean baking pan and pour the cooled filling over, spreading evenly. Top with the other half of pastry and refrigerate until cold. When ready to serve, cut into rectangles with a serrated knife and dust heavily with confectioners' sugar to look like snow on a mountain top. Refrigerate leftovers.